So we’ve been busy these last couple of days. 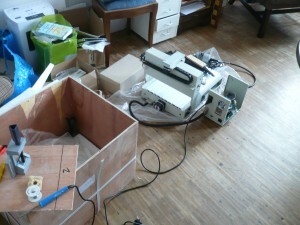 Apart from our new toy (more on our progress with our CNC router soon!) we’ve hosted two workshops last weekend, totaling 16 Everykeys built. 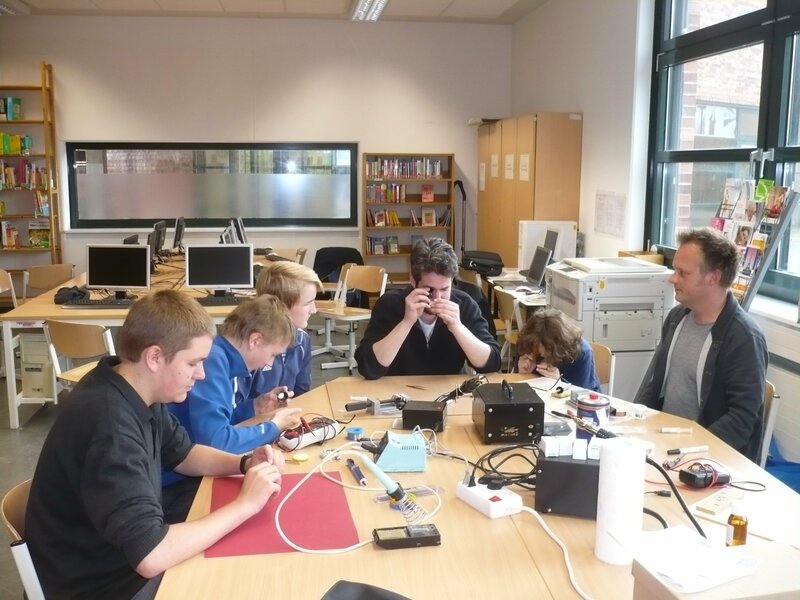 First workshop was on Saturday at the Elisabeth-von-Thüringen-Gymnasium in Cologne. It was incredibly fun to work together with a group of highly motivated young adults and we’re very anxious to find out what sort of things they’ll be building with the keys…. unfortunately in a way, there was such high demand for the workshop that we couldn’t fit everybody in. More people ended up showing that had registered and it was quite a tight fit with 10 participants. Because of the waiting list, we’ll definitely be holding more workshops, including not just “solder your own” events, but also some more in depth programming workshops in which we’ll delve deeper into embedded programming. Send us a quick mail (info@everykey.de) in case you’d like to be informed about future workshops, know of a good venue within a reasonable distance from Cologne or would like a “private” session at your school or company or just want to chat. Thanks very much to all the great participants and the feedback you’ve provided! We’re offering an Build-Your-Own-And-Learn-How-It-Works workshop for the Everykey on Sunday October 14. 2012 at the Dingfabrik in Cologne! In this workshop we’ll solder an Everykey development kit. The Everykey board is a tiny prototyping and development board. It can be used to build USB peripherals, standalone applications or to simply have fun with a powerful embeded controller. SMD soldering seems challenging at first: the components are tiny! In this workshop we’ll show you it’s nowhere as difficult as you might think. Being able to solder SMD opens a whole new world of components to you that just aren’t available in the old, through-hole world, from more powerful microprocessors to mems gyrosensors. While we’re soldering we’ll explain the functionality of all the parts in detail, you won’t be just be putting together a puzzle, but gain a full understanding of how the circuit works. The board features a powerful 32-Bit, 72 MHz ARM Cortex M3 microcontroller, a full-speed USB port, a LED, a button and solder points for most of the processor’s pins. The design of the board and the SDK we’re developing is completely open source. Once it’s assembled it’s just as easy to work with as Arduino, just much more powerful. People with glasses should bring a magnifying device compatible with their eyewear! Incidentally, there will also be Introduction to Electronic Workshop at Dingfabrik the weekend before our workshop. We’re not associated with it, but it sounds fun. Also, in case you’d like a similar workshop at your company christmas party or something, we are for sale!